Take it or trash it, one of the most emblematic music collaborations ever recorded in Nigeria’s hip-hop history is the classic track “Too Much” from the legendary DJ Jimmy Jatt’s The Definition album. A clear masterpiece featuring the best female voices in Nigeria’s hip-hop namely Blaise, Sasha P, Kemistry and B.O.U.Q.U.I (pronounced Bookie), it represents the best documented moment in Nigeria’s music culture, where women rocked the microphone as though they owned it. And they did. Actually, the 90s and the early years of the new millennium constituted a milestone for many female rappers, both home-grown and returnees. One can name it ‘the rap boom’ period in Nigeria’s music history. Sadly, in recent years, the plummeting figures of female rap artists in Nigeria had propelled a lot of rhetorical questions in the media as regards the whereabouts of many of these artists and why they have totally abandoned music when their careers peaked or even before it took off. Worldwide, hip-hop or rap is absolutely dominated by men because the earliest known rap battles started with the street rappers, mostly male. However, many of them had female protégées and it was a different taste entirely when a female voice runs over some heavy rap material. For strange reasons, the template for female hip-hip artiste’s image began to evolve after the years of the Salt ‘n’ Pepa, Queen Latifah, MC Lyte to become sexually appealing. The unwritten code for female rap artistes from the period of Young Mafia and the birth of Lil Kim was all about exploring the female sexuality instead of wit to sell this brand of “supposed’’ intellectual music. 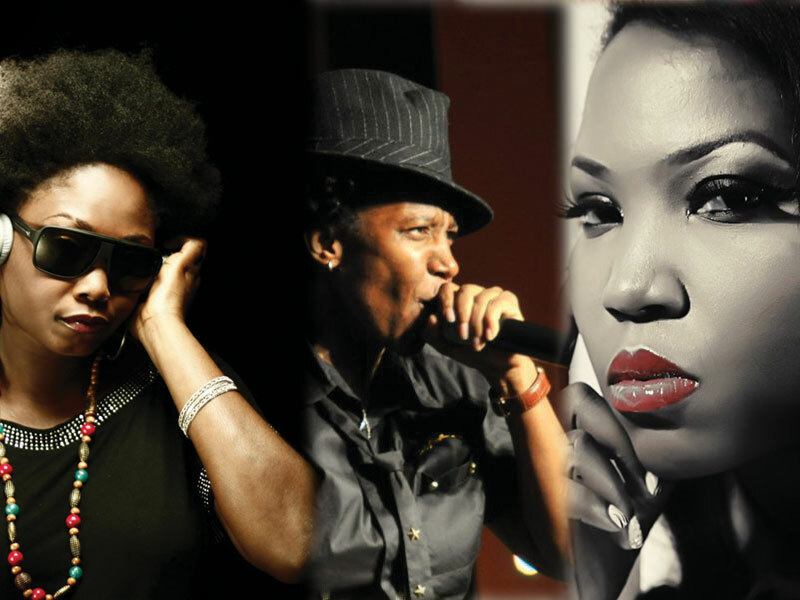 Irrespective of their pedigree, the stories of Nigeria’s female rappers are very similar. It could be parental rejection, record label’s preference for male artists or other competing career interests that the individual artist may peddle that serve as obstacles for progressive music career. Weird MC, a UK-born rapper and perhaps the most zestful female performer Nigeria had ever produced didn’t enjoy parental support in her early years. Her story mirrors BOUQUI’s, a professor’s daughter who opted for gospel rap. Weird MC dropped out of a law degree programme at the Ogun State University, toyed with basketball before returning to the UK where she participated in several rap battles, one of them being Club 291 contest, where she made it to the top three. She came back to Nigeria to drop the Simply Weird album with the song, “Allen Avenue” ruling the airplays but not record sales. After a decade, Weird MC dropped a beautiful cocktail of multi-genre sounds in the album, “After Da Storm”. “Ijo Ya”, a dance track from the album had such cross-over appeal that was lacking in the previous album owing much to her infusion of rich African elements in language and drums. She earned a nomination at the The Headies in 2007 with that hit song produced by Don Jazzy and JJC. Born Anthonia Yetunde Alabi, Sasha P today is regarded as the ‘First Lady of Rap’ in Nigeria for her phenomenal success in Nigeria and internationally as a recording artist. Though a lawyer by training, she got her break in music when she joined Eldee’s Trybe Records. Much later, while in search of greener pastures at Storm Records, she released her debut album First Lady, which includes “Adara’’, a hip-hop anthem chronicling her challenge as a female artist with an overriding theme of optimism. Till date, she is the most decorated female rapper in the continent, winning Best Female Artist at the MTV Africa Music Awards. In 2013, she announced that she would take a break from music to pursue other interests- fashion and humanitarian causes. Blaise, touted as the best rival to Sasha P in rap artistry, is an architect with preference for lyrical construction. Blaise is arguably the fiercest lyricist till date in the female hip hop territory in Nigeria with eruptive punchlines, tight rhymes and unique voice. She sprang from the Nigerian rap crew, Da Trybe to record some of the most daring hard-core rap seen in such collaborative tracks like “I No Send You’’ and “Lasan’’. The whole story will be incomplete without the mention of the contributions of the likes of Munachi, Mo’cheddah, Kel and Eva Elordiah. They represent the last set of top-charting hip-hop queens in Nigeria but had to pursue other competing interests when the stage-lights began to fade on their music. To get an insider’s perspective into the real reason for the gradual extinction of female rappers in Nigeria, THISDAY sought the views of the award-winning Nigerian-German singer-songwriter and producer who is known for initiating a monthly concert series, Afropolitan Vibes, Ade Bantu. Invariably, it is in vain for a female singer or rapper to be gifted in the artistry if she can’t twerk to the tunes of the industry’s pipers. One of the strongest criticisms against some female rappers is in their performance strengths. “I think when it comes to stage performance, the Nigerian music scene is still lagging behind,” he argued. “We have exceptions in some younger artists like Burna. Specifically, in the hip-hop genre, it is usually between the DJ and the artists. But now, I think things are shifting and some are performing with live bands. It all boils down to the economics of music. For you to sustain a band, you need to have funding. It is very expensive to maintain a band. “At the same time, they want you to be as good as the male. They set standards that are unattainable. If you are not a tomboy, you appreciate your naturalness and you are just being yourself, people will put you in a certain pigeon-hole. Look at what has happened to the likes of Weird MC. Women are not allowed to develop,’’ he remarked.